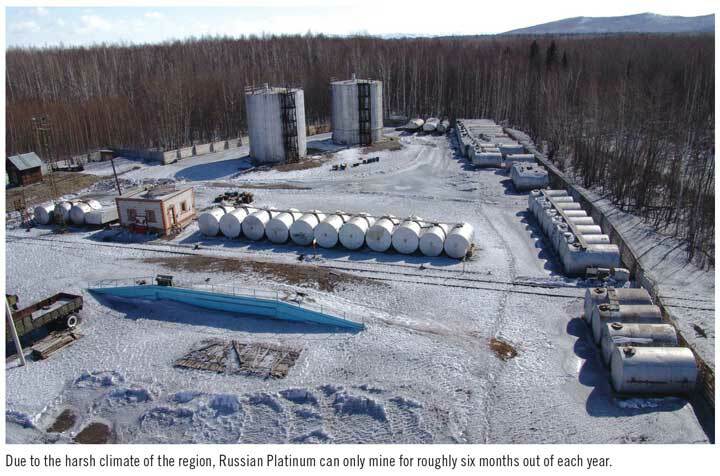 Russian Platinum (RP) aims to invest $4.4 billion to launch mining operations at two deposits in Krasnoyarsk Krai in the middle of Siberia, bringing Russia’s overall platinum production capacity to 70 metric tons (mt) by 2029. The implementation of the program became possible after the state-owned VnesEconomBank (VEB) approved a large-scale loan at the end of 2015. At the moment, RP mines platinum at the Kondyor placer deposit in Khabarovsk Krai, where production varies with depleting reserves from 2.4 to 3.6 mt/y. Here, the company is also testing various technologies for any possible increase in efficiency for its mining operations and implementation at other projects. According to RP’s co-owner Musa Bazhaev, the company plans to start mining platinum at the Chernogorsky deposit in 2018 and the southern part of the Norilsk-1 deposit in 2019. In 2020, the company plans to reach commercial production on both projects, with capacity reaching 5 mt/y. The projects should reach full capacity of 70 mt/y of platinum in 2029. By that time, the company expects to be one of the top three platinum producers in the world. 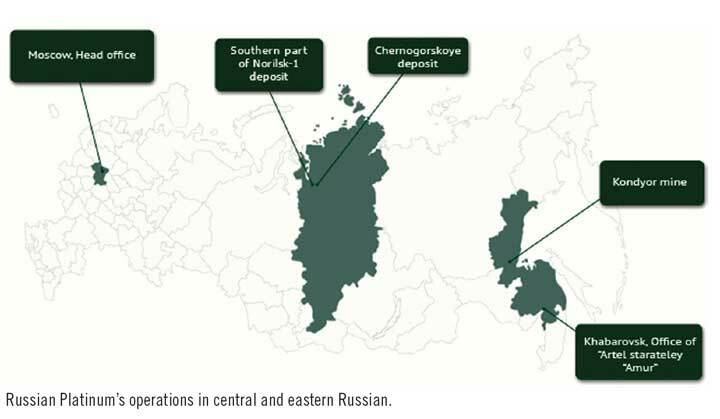 Musa Bazhaev also explained that, of the $4.4 billion investment, the company will need $1.2-$1.3 billion for the development of the Chernogorsky deposit, while the rest ($3.1-$3.2 billion) will be invested in Norilsk-1. The company said the Chernogorsky deposit has 143 million mt with an average grade of 0.22% nickel, 0.29% copper and about 3.9 g/mt platinum group metals (PGMs) and gold. The PGMs are located at a depth of 20 m in the western part and 245 m in the eastern part of the deposit. RP will build a mill and smelter where the concentrate will be processed to produce a copper-nickel matte. The company also plans to build a plant for hydrometallurgical processing of copper-nickel matte. Initially, it had expected to produce first metal from the deposit by 2015, but the company postponed the plan due to a lack of funds. The reserves at Norilsk-1 are believed to contain 1,500 mt of PGMs and RP plans to develop both projects within a joint industrial cluster. Based on 2014 estimates, production costs were $600/mt of platinum, which is significantly lower than mines in South Africa, which are the leading platinum producers today. RP has not re-evaluated production costs, but they believe costs will be lower due to the devaluation of the Russian ruble. According to Galaev, RP initially targeted to launch construction of the relevant infrastructure in 2014, commissioning a refinery and metallurgical plant in 2017. However, this strategy has been postponed for two years, so constructiois now scheduled for 2016, while the actual commissioning should take place in 2019. Galaev thinks the new production cluster will comply with the most stringent environmental standards. Since it purchased the license to develop the Chernogorsky deposit and Norilsk-1, RP has revised its plans several times. As a result, the company has faced sharp criticism from Russian officials, some of whom claim the company bought the assets with no intention to develop them. According to Alexei Mukhin, CEO of Russian center for political information, when the company was competing for the license to get the deposit against Norilsk Nickel, the issue was resolved by Russian Deputy Prime Minister Arkady Dvorkovich, who is believed to be a close friend of Musa Bazhaev. In the autumn of 2014, Bazhaev sold part of his stake in Alliance Oil Co. for about $1.5-$5 billion, according to market analyst estimates. Russian media said that shortly afterward, business affiliates purchased the Forte Village resort in Sardinia, a place Dvorkovich frequents. In 2015, it is believed that Bazhaev appealed to the Russian budget for guarantees on a loan for RP’s project in the amount of RUB 220 billion ($3.5 billion). This caused a tide of protests among officials, politicians and representatives of the mining industry, who claimed that in the context of sanctions and the country’s poor economy, it would be inadmissible for Russia to loan money to a group which does not intend to build mines and mills, but invest money in expensive foreign resorts. Some have now called to cancel RP’s license for development of deposits in Krasnoyarsk Krai and grant them to another company. As a result, RP’s officials have made repeated statements assuring that the company is going to begin mining, despite any challenges. Today, RP is the second largest producer of platinum in Russia, after Norilsk Nickel, which has an annual capacity of 20 mt. In 2015, RP increased the volume of platinum production at Kondyor deposit by 19% compared to 2014 to 2.8 mt. 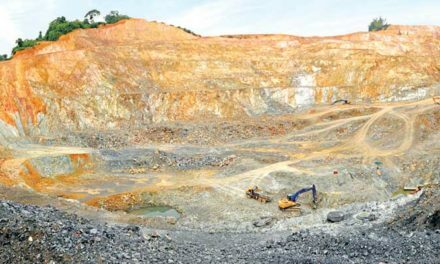 RP’s heads also disclosed plans that, shortly after mining launches at the new deposits, it will go for an IPO. 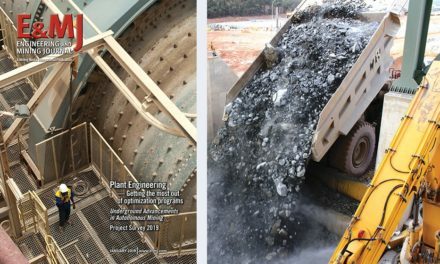 efficiency of mining operation and reduce the costs per ton. According to Kazbek Bazhaev, CEO of AS Amur, a subsidiary of RP which manages the development of Kondyor, the technical experience obtained will allow the company to be more efficient during the implementation of a project in Krasnoyrsk Krai. He pointed out that new methods have been developed for dredging and tailings processing and construction of a mobile processing plant. In 2013, a plant for extraction of fine platinum was launched at the deposit. 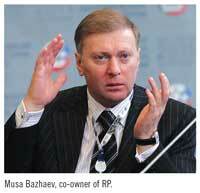 “The tailings contain a lot of platinum, which is not visible to the naked eye,” Bazhaev said. “Our mobile factory will be able to extract these fine particles.” In 2013, he estimated PGMs recovery of 85%, which means 15% reported to tailings. The long-term strategy is to reduce this figure to 5%. This will enable RP to produce an additional 300-400 kg/y of platinum. There are four key stages of production from mine to end product. The first is pre-stripping and the preparation of production blocks. This work is performed mainly from October to May prior to the platinum production season, which is limited due to extreme winter conditions. Platinum-bearing ore is extracted and concentrated on site. The concentrate is shipped to a refinery. The company has introduced some IT solutions for the mining process. Since 2013, GPS has been installed on 130 haul trucks, excavators, bulldozers and drilling machines, as well as 73 pieces of auxiliary equipment. The entire fleet is connected with the company’s office in Khabarovsk. He also explained that this control system completely eliminated unreasonable delays and minimized delays for technical reasons. In addition to improving the effectiveness of logistics, it reduced fuel costs by 15%. However, according to Amur’s management, shifting to dredging will not happen before the end of 2016, as the company previously planned to use equipment from a local manufacturer from Irkutsk, Russia. However, during preliminary tests it turned out this equipment was not a match for the mining conditions, so the company has to purchase equipment in the Netherlands. Importing equipment is very expensive. 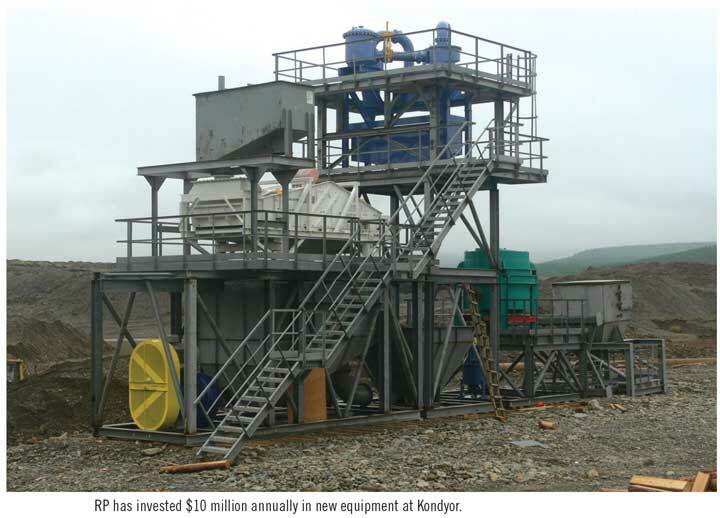 The company expects to maintain the level of platinum extraction at the Kondyor deposit for the next 10-15 years. As of the end of 2014, on-balance stocks totaled 17 mt. Re-evaluation of those stocks could increase the life of the operation to 20 years. 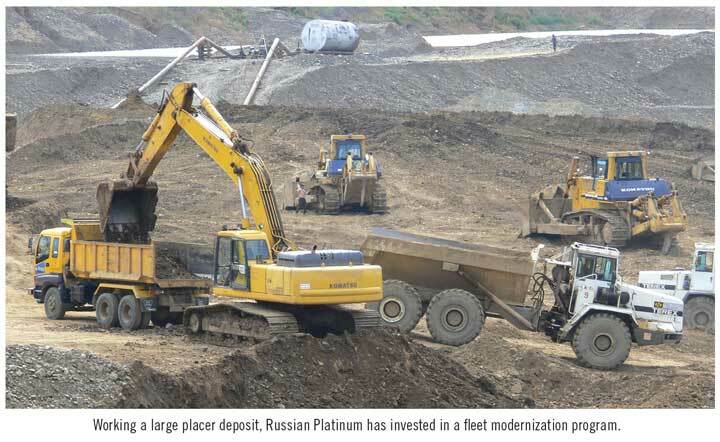 Working a large placer deposit, Russian Platinum has invested in a fleet modernization program. NextMotors and drives perform critical service throughout any mining operation.